DENSO Air Systems is a global company with headquarters in Japan. We have plants located in Japan, China and Czechoslovakia as well as North America. We are manufacturers of automotive aluminum HAVC pipes, tubes and hose assemblies. We are a member of the Global DENSO group and DENSO Air System manufacturing network. DENSO Air Systems Michigan, Inc and DENSO Air Systems Mexico, Inc were formed October 1, 2009. The North American operations combined Koyo Corporation in Battle Creek, Michigan and GAC-Mexico in Monclova City, Mexico. A third facility will soon be in operation in mid 2011 in southwestern Kentucky. 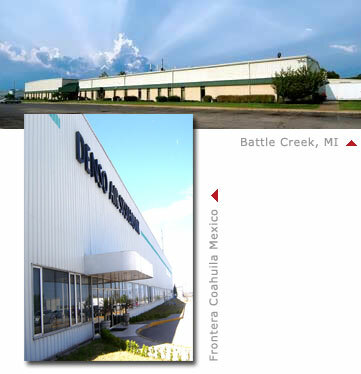 The North American Headquarters for DENSO Air Systems is located in our Battle Creek, Michigan facility. Our main customers are Toyota, Honda, Subaru, Chrysler, Ford and GM along with Mitsubishi, BMW, Mercedes and Fleetwood. Our operations in North America employ over 1,250 people with multiple shifts and can make over 500 different part number assemblies using as many different and dedicated processes. Our operations follow the ‘Toyota Production System’ with a very strong emphasis on quality in every thing we do. Our management is a cultural mix of Japanese and North American style combining all the strong attributes to a very efficient hybrid. Lead the competitiveness of piping business to assure DENSO’s air conditioning business expansion. Expand the piping business to assure Air Systems continued growth. Lead the North American supply base of piping in quality, cost, delivery and customer satisfaction. Associates who drive the success of the company by their professional pursuit of continuous improvement.